According to the World Economic Forum, it is estimated that by the year 2025, 10% of the world’s GDP will be on the blockchain. That equates to around ten trillion dollars. In 1991, E-Commerce hit the world by storm, creating a wave of transactional data flowing through the World Wide Web. While this was revolutionary and linked together millions of customers and retailers — this came with its problems. It’s no secret that the fees charged by payment processors are downright extortionate. For fledgling businesses, this is a major issue as your margins are immediately tightened to the extent where profitability is a real task. This doesn’t just hit the little guys, but retailers are also faced with a mountain of other issues that come with the monopolisation of online sales by the giants. With Distributed Ledger Technology, not only will there be cheaper transactions, but also an added security buffer alongside this. This is just as revolutionary as the inception of E-Commerce itself. Your data is not currently secure. It’s collected and subsequently misused by the E-Commerce platform behemoths. Data gets stolen, systems get hacked, and who are the ones that bear the brunt of this? The consumer. All your payment information is at risk, as not only do these platforms store the customers’ data, but the retailers’ data too. With DLT, this information is securely held in every customers’ individual node. A marvellous and groundbreaking new system where data is immutable and cannot be lost or stolen. While we’re on the topic of security, one naturally must talk about fraud. In 2017, between the months of May and October, an estimated $2.1 million of losses were recorded. That was made up of 3,973 individual cases, all down to individual ticket fraud. This is when tickets are faked, or simply just don’t arrive. Last year, Ticketmaster was the victim of a massive data breach, where an estimated 5% of its global user-base was affected. Given that Ticketmaster claims to serve 230 million customers globally each year, this is not an insignificant number. These occurrences are not rare ones either. Data breaches are becoming part of the status quo in modern E-Commerce. The industry is screaming out for a solution. Elastos Ticket is a dApp powered by the DMA platform (Decentralised Digital Marketing). It is completely open to the world and we welcome anyone who wants to create a local ticketing business to use it and freely customise their own dApp. The DMA framework provides developers the tools needed to create such decentralised applications – a conduit of services, enabling applications such as Elastos Ticket to tokenize the ticketing process, thus eliminating the problems plaguing the industry. Tokenized ticketing is just the first example to demonstrate the power of DMA. Tickets are also just one kind of tokenized digital asset — DMA covers a broad spectrum. Through Elastos Ticket, consumers are able to buy, sell, send and transfer ownership of tickets in the secondary market. Ticket issuers are able to put restrictions on the tickets (Frequency, liquidity, price) following a completely non-fungible token standard. Customers can use DMA tokens to purchase a variety of performances in the ticket industry. These can then be resold on the secondary market. This solves the long-standing issue of re-selling tickets after purchase. Consumers will not even realise they are utilising blockchain technology, but will still benefit greatly from this revolutionary new system. In our opinion, this is how adoption of the technology will prosper. Ethereum Sidechain: This gives you the ability to issue non-fungible ERC-721 tokens. Pulse (Permission based data collection) You own your data, and only you can give permission to monetise this information. Carrier Network: A completely peer-to-peer network, allowing the free-flow of data to pass through individual nodes dotted around the globe. There is no one point of failure, limited attack vectors and your data remains secure. Exchange: The decentralised digital asset management protocol. The above are just some of the highlighted services that DMA provides. These combined elements truly give the power back to the people. And at the same time; eliminate fraud and a slew of other issues, with one example being ticket bots. These bots enable scalpers to buy tickets en-masse and sell to unsuspecting customers at an obscenely inflated rate. We believe once the DMA platform is in operation, and after the pilot dApp ‘Elastos Ticket’ is launched, there will be a steady stream of innovative dApps and business models created by the global community. This is how the eco-system will flourish. The industry needs a complete overhaul, one that is transformational and will invoke trust back into the people. Your data is your property and will no longer be unwillingly sold off to the highest bidder. 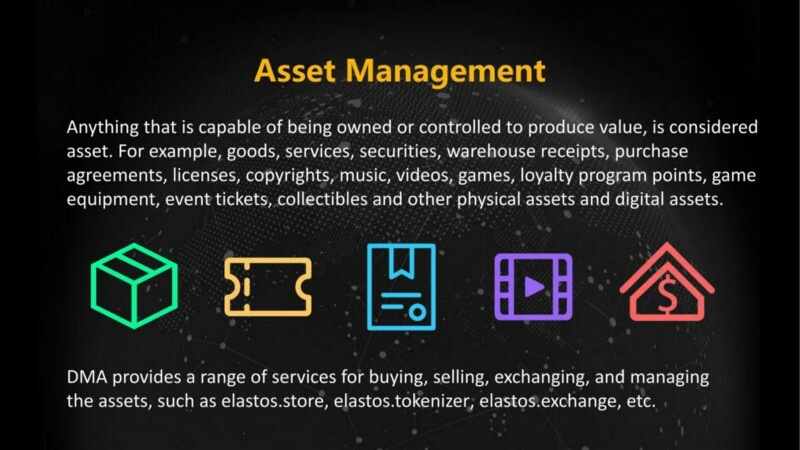 With online sales estimated to hit $4.5 Trillion by 2021, Elastos Ticket is just one piece of the DMA puzzle that aims to confidently tackle these issues.